WE ARE FEATURING A DELIGHTFUL & COLORFUL E. VINCENT DRAGON - SIAB ARTIST SIGNED MYSTIC FANTASY COLLECTOR SERIES CURIO FIGURINE. OUR NEW, UNSOLD AND VERY DETAILED MERLIN THE WIZARD AND HIS SLY LAUGHING TOAD - FROG FAMILIAR STYLED STATUE IS IN MINT CONDITION AND COMES WELL PROTECTED IN ITS ORIGINAL GIFT BOX. IT HAS THE E. VINCENT DRAGON FIGURINE SERIES TINY COMPANION DRAGONFLY SEEN ON EVERY ORIGINAL PIECE SITTING ON THE DRAGON'S SPELL WORKSHOP'S MAGICAL CASTING TABLE - ALSO READING THE ANCIENT SPELLWORK BOOK OF SHADOWS WITH THE MAGICAL AND CONCENTRATING DRAGON! 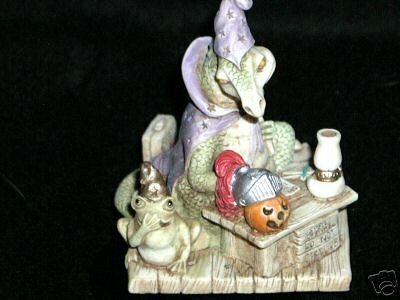 OUR DETAILED AND COLORFUL MAGIC FANTASY ART STATUETTE FEATURES THE SMUG TOAD or FROG TRYING TO HIDE A SLY GRIN and LAUGH, THE LABELED "SPELL CASTING - DO NOT DISTURB ALTAR TABLE" A VERY CURIOUS LIZARD CRAWLING UP THE MAGICIAN'S STAR ADORNED WIZARD'S ROBE IN THE REAR BY HIS HANDY FIRST AID KIT, AND A TINY CUTE MOUSE POKING HIS HEAD OUT OF THE SPILLED SUPPLIES BAG AS OUR ENLIGHTENED AND WISE DRAGON HOLDS HIS PRECIOUS GOLD CELESTIAL STAR CROWNED MAGIC WAND AND WORKS ON! OUR 1998 COLLECTABLE DRAGON'S KEEP ART AND GIFT STATUE IS CRAFTED FROM ART QUALITY POLYRESIN, DATED AND SIGNED BY THE ORIGINAL ARTIST ON ITS BASE. IT'S ABOUT 3 1/2" TALL AND RESTS ON A 3 1/8" BASE. If you have any questions about this product by Dragon Squama, contact us by completing and submitting the form below. If you are looking for a specif part number, please include it with your message.